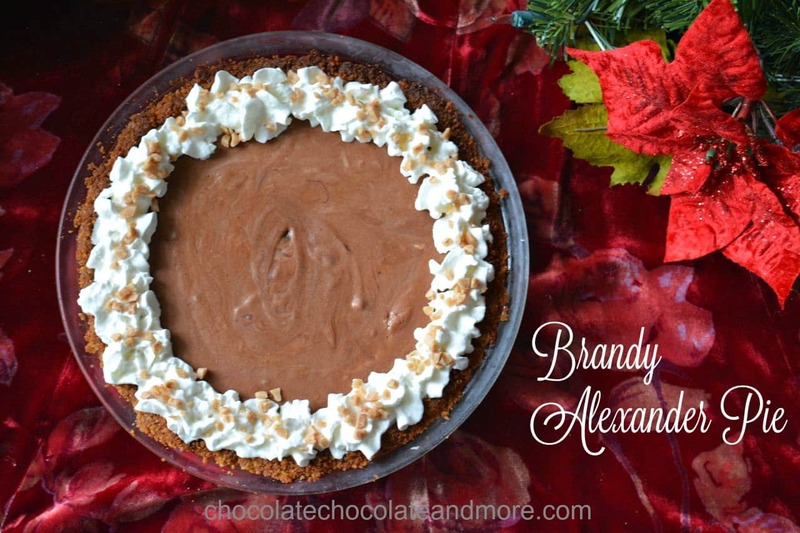 Brandy Alexander Pie - Chocolate Chocolate and More! 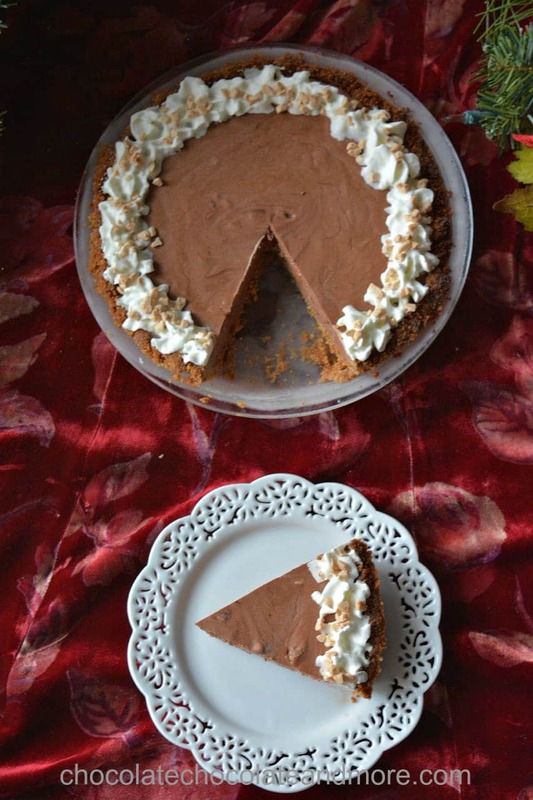 A walnut biscoff crust filled with chocolate brandy mousse make this Brandy Alexander pie a sure hit for the holidays. This week has been pretty crazy. I made it my policy some time ago not to watch election results on election night. Once you’ve voted, there’s nothing you can do about the outcome. People have usually decided long before who they’ll vote for so it’s just waiting for the vote to be counted. To get my mind off politics, I started baking and listening to Christmas music. Regardless of your faith, there’s something uplifting about the winter holidays. Hanukkah, Christmas, and Kwanzaa, all celebrate what’s good in us and I feel like the world could use a lot more good right now. I’m really looking forward to having my family together at Thanksgiving. We haven’t all been together in over a year so it will be precious time for us. Becky is flying in from Indiana. Matt and Tim live in town and may bring some friends over. I’ll invite some older folks from Church. We’ll eat till we can’t any more and celebrate the love we have for each other. I’ve already got a Brandy Alexander pie in the freezer and I’ll be making more pies (apple, pecan, cherry) as our celebration nears. I found this recipe along with the eggnog pie recipe in an old recipe box. I didn’t have creme de cacao so I just added chocolate to my pie. You could leave the alcohol out entirely for a dense chocolate mousse pie. If you want an entirely no-bake pie, you could buy a pre-made graham cracker or chocolate crust at the store. The recipe called for a “nut crust” but that part was missing. I made mine with walnuts and biscoff. The toffee flavor of the biscoff really pairs well with the filling but a chocolate crust would be amazing as well. You can also use a store-bought graham cracker crust for a no-bake option. Pulse nuts and cookies together in a food processor. Mix with butter and press into a pie pan. Bake at 425°F for 15 minutes. Let cool. Heat marshmallows and milk together until marshmallows completely melt. Add chocolate and stir in until chocolate is melted. Let cool until room temperature. Add brandy. Beat whipping cream until stiff peaks form. Fold into chocolate mixture and pour into prepared crust. Refrigerate 8 hours until firm. Garnish with whipped cream and toffee bits. Brandy Alexanders are delicious cocktails, and this pie version sounds delicious! I definitely could eat several pieces and not regret a bite! Thanks for the pointer on the no-bake option, too!